Rihanna Won the Ocean's 8 Premiere Red Carpet, Thank You Very Much for Asking! 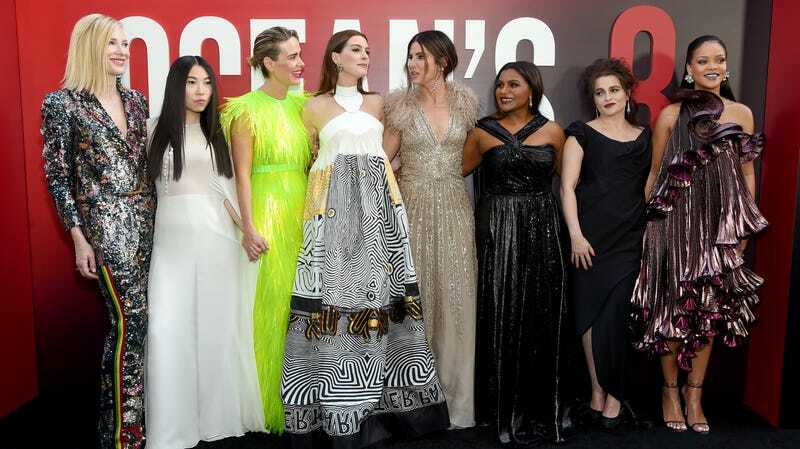 Last night, the eight stars of Ocean’s 8, a heist movie featuring jewel thieves who are also women, walked down a red carpet on a beautiful New York City evening and for the most part, everyone looked great. However, Rihanna was there. That means she won. I’m sorry. Here she is, a queen, a goddess, a vision, draped in what looks to be an extra-terrestrial being’s flesh suit, made into a beautiful garment!! It’s iridescent calla lillies; it’s plissé; it’s a disco octopus. It’s Givenchy, and even though the Daily Mail hated it, I think it’s sublime. There is nothing I love more than Helena Bonham Carter on a red carpet; here she is looking elegant but bored as hell in a black Vivienne Westwood with a slit in the front that looks ill-fitting, but is probably meant to be that way. Where else would you like to be, Helena? What other engagements have you to tend to? Have you woken up and found yourself at Alice Tully Hall in Manhattan’s beautiful Upper West Side and wondered why? A formal pantsuit for the red carp is always a nice, practical choice—comfort over fashion or something, I dont know! Cate Blanchett in Missoni is striking the right amount of formal and also fun? Wear this to the Oscars, Cate. Wear this to the grocery store. You look great. Here is Awkwafina, a.k.a. Nora Lum, a.k.a. the woman responsible for “My Vag,” dressed like a benevolent goddess in cream Reem Acra—it’s bridal, but only if you are getting married to a cult leader on a crag overlooking a desolate Sierra wilderness. In short, it is perfect. Sarah Paulson’s dressed like a furry, fuzzy highlighter in Prada, and I’m sure everyone hates this dress because it’s UGLY and it’s BOLD and it LOOKS LIKE A MUPPET, but that’s why it’s interesting and FUN and worthy of praise. The tiny bag kills. The entire look kills. More celebrities should have fun on the red carpet!! This is fun! Wear neon! God!!! Hello Mindy Kaling, and hello to your sparkly Prabal Gurung frock that includes a fun slit on the side. This dress is just fine—not quite Met Gala, not quite Oscars, but somewhere in between? It’s a prom dress—albeit a very fancy and EXPENSIVE prom dress, but that is what it is. Have we seen Sandra Bullock in this look a million times before? Maybe! But the marabou feathers on this Ellie Saab Old Hollywood-glamour gown are fun and this entire outfit looks expensive and not tacky. Do we need the earrings with the feathers? You tell me. The impulse to be comfortable on a red carpet when you are already wearing a heavy earring, what have you, makes sense to me. This Gaultier number, ripped fresh from the 2018 spring runway, is not totally working. I am grateful she did not choose to style it as it was on the runway, but you know what, I’ll say she’s doing her best. She is! Here’s a parting glance at the best of the best.